We arrived in Huahine (HOO-ah-HEE-nay) in the morning at around 8:30 after some traveling through some stormy weather. The gentle rocking motion of the ship wonderful for helping you sleep peacefully through the night. 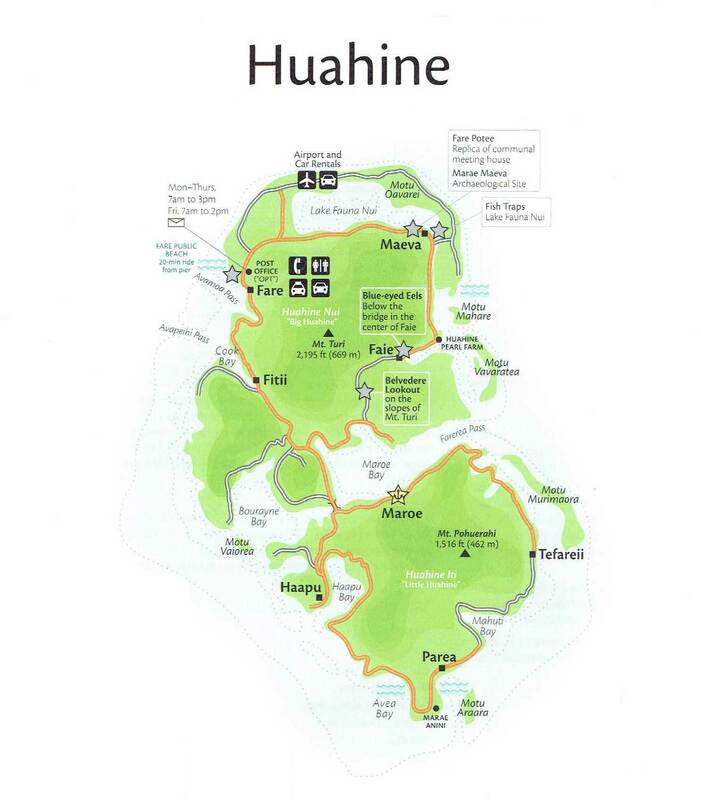 Huahine is actually two islands Huahine Nui (big island) and Huahine Iti (small island). The ship anchored in Maroe Bay and tender boats transferred guests to the shore on Huahine Iti near the town of Maroe. 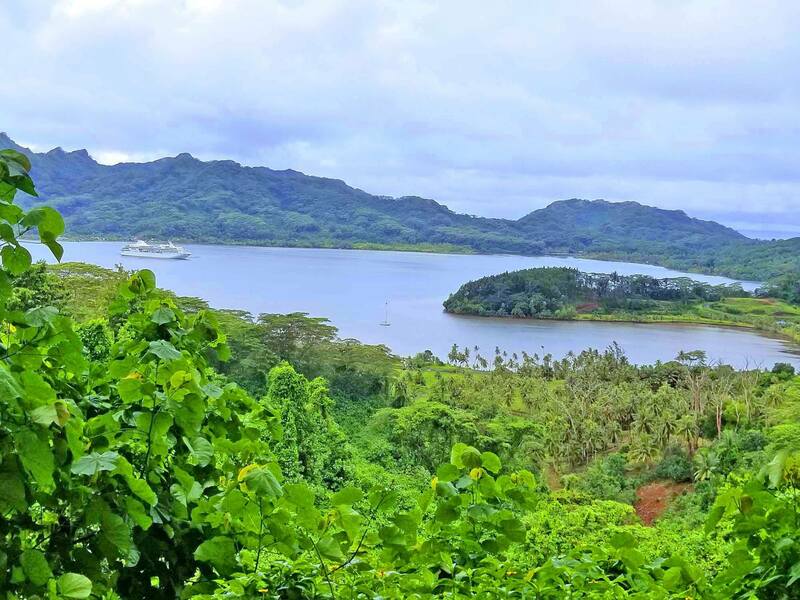 The islands are both very lush and tropical with green everywhere. We boarded our truck where we were to set off on our excursion of Huahine Nui and were greeted by out driver/tour guide, Poro’i. We set out across the longest bridge in all of French Polynesia (about 100 feet) and were given the opportunity to hop out and take some photos of the bay. Our guide discussed with us what we were going to see and do on the trip and pointed out some of the interesting vegetation. Did you know that Huahine islands are home to 13 different mango species? Our first stop was Belvedere Lookout a beautiful look out point about halfway up Mt. Turi where we had a fantastic vista over the bay. Everyone on the tour with us were all taking photos of each other so we could get nice shots of the expansive tropical vista and our smiling faces. We boarded back into our trucks and headed out to a great stream where we were to meet the local pets of all the inhabitants of Huahine, the blue-eyed eels. As we arrived at the river where the eels were, there were a few local children playing with them, tossing them around and petting them. We learned that these eels have some mythological significance to the locals and that they never eat the eels. Our guide fed some of them so we could get an up close look as they were feeding. These eels are massive. Check out the feeding frenzy in our video. Our next stop was going to be a boat ride out to a black pearl farm. Black pearls are a large industry for the Polynesians as they can only be produced in the lagoons around the islands with the local variety of oysters. We learned about how the pearls are farmed and how to judge quality and value of pearls. 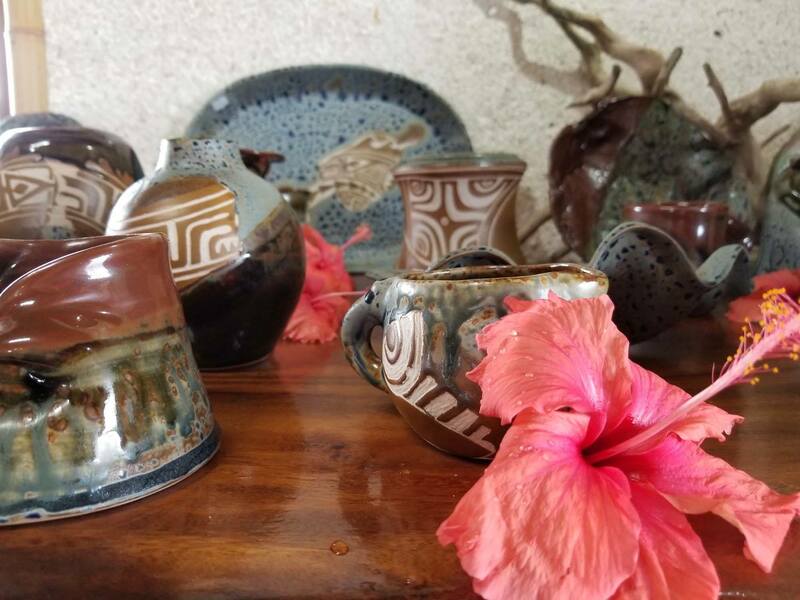 The farm had some beautiful jewelry for sale as well as some locally made pottery. 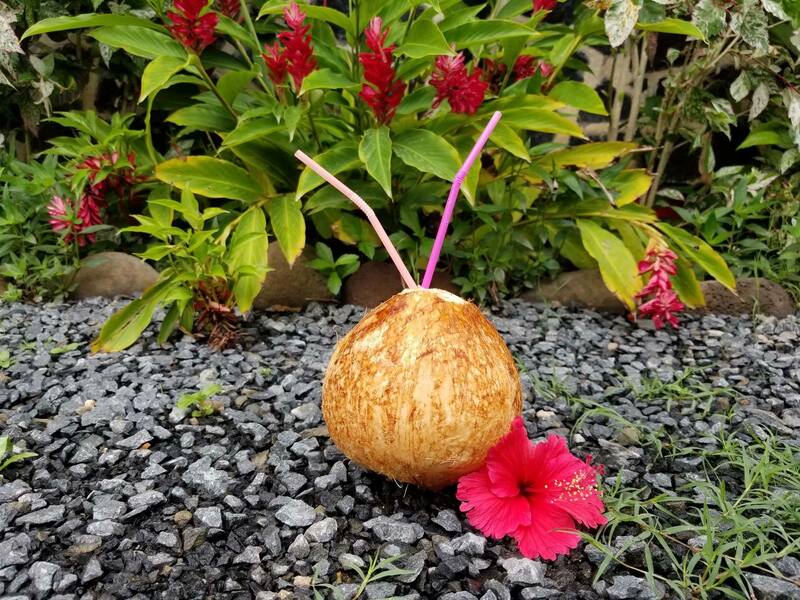 After our boat ride back to shore, we were treated with some fresh from the tree coconut water (literally a straw into a coconut) and some of the history and myths surrounding the coconuts and eels of Huahine. After we had finished our coconut we headed out to learn about how the locals catch fish for everyone on the island and how the catch is shared. Fishing traps were constructed by the villages in the mid-19th century and are still used today. We learned how the fish are scooped out of the ocean and kept fresh. On a typical day, around 300-500 fish are caught using these traps. Our final stop along our journey, was to a maeva or archaeological site where a temple had been reconstructed in the traditional construction techniques. Within the temple was a museum on history of Huahine and the people and culture of these two small islands. 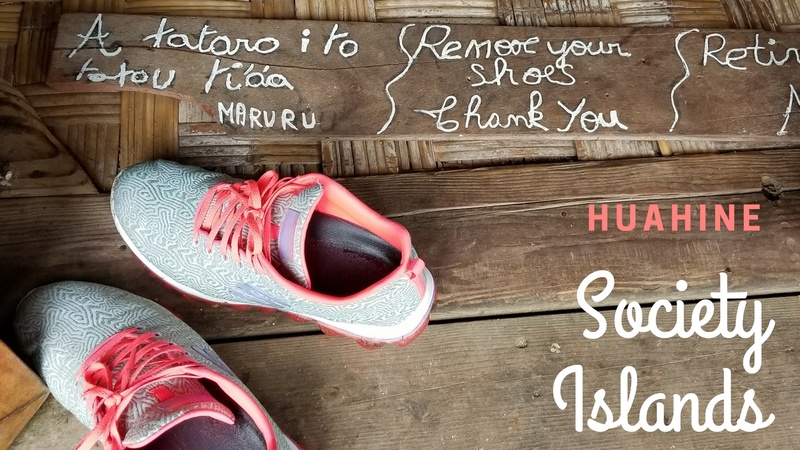 One of the most memorable stories is of Hotu Hiva. She was cast out by her father after she took ill and the local medicine man was unable to cure her. She was set adrift in a drum and sailed for four days until washing ashore in Huahine. The local chief of Huahine married her and they had 8 sons. She united the different tribes across the two islands and her sons formed the eight districts of Huahine. Around the outside of the temple we learned about the historical sites where islanders made sacrifices to appease the gods. Livestock, crops and even men were sacrificed in religious ceremonies where after wards the sacrifice was feasted upon by the village. In the afternoon before the ship set sail for our next port, we were treated to the "Children of Huahine Show." 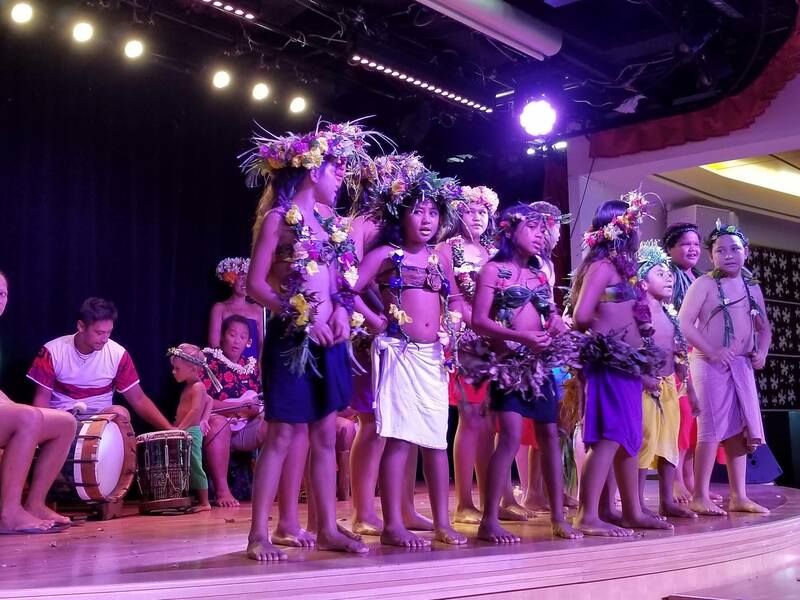 A heartwarming display of traditional Polynesian dancing by local children on board the ship in Le Grand Salon. The kids were super cute as there was even a very young boy who, although he couldn't have been more than three years old, was determined to play the drums and be the center of the dancing show. The show even got interactive as the kids brought members of the audience down, including my wife, to teach them a few moves. I'd advise you try to catch the show while you're sailing on the Paul Gauguin as this was truly one of the highlights of the whole trip for us. Children of Huahine show. Aren't they just so cute? Stay tuned for the next chapter in our voyage. Have any favorite memories of Tahiti, French Polynesia, or Paul Gauguin Cruises? Leave a comment and share your story. 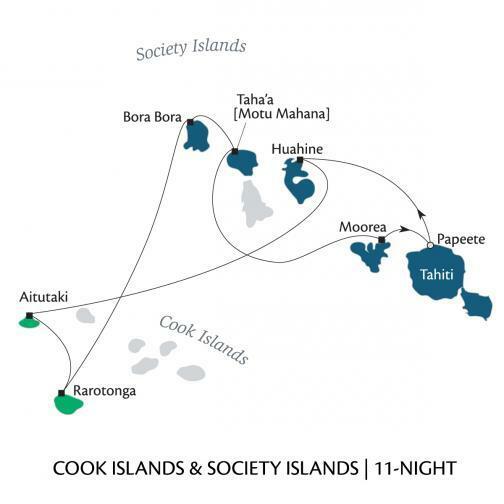 If you would like some additional information, or to reserve your trip to French Polynesia, contact us here.